The “Package of measures to implement the Minsk Accords” (see the full text in Russianhttp://www.pravda.com.ua/articles/2015/02/12/7058327/ ) agreed in Minsk on 12 February contains thirteen clauses and an explanatory note. Let’s go through them one by one and ask ourselves what they mean. An immediate and comprehensive ceasefire beginning at 00h on 15 February. A contradiction in terms: one cannot have an immediate ceasefire that will start in three days time. The Russian delegation insisted on this date, arguing that since the negotiations in Minsk extended from Wednesday into Thursday, the originally proposed date for a ceasefire on 14 February should also go over to the next day. 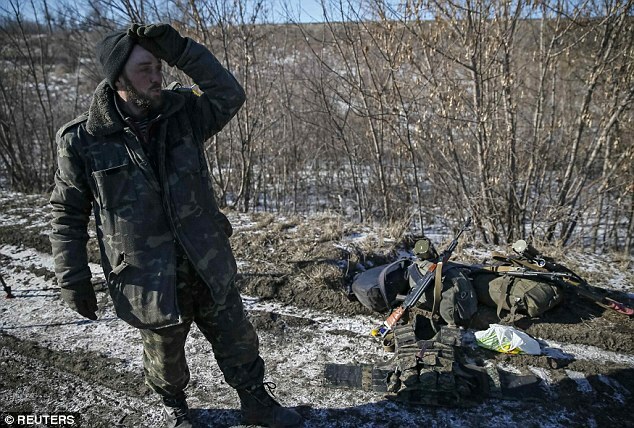 The real reason: for the forces of the Donetsk Peoples Republic and Luhansk Peoples Republic to have enough time to capture Debaltseve, which is the hub of ALL electrified rail transport, the railway hub for the coal and steel industries, and the point through which passes the main highway linking Donetsk and Luhansk. With Debaltseve in their hands, in addition to the 500 square kilometres of territory they have taken since September, the DNR and LNR forces have a territory that is more economically viable and a transportation infrastructure through which Russia can supply them. So the real purpose of this clause is not to have a ceasefire, but a final escalation of the fighting. Beginning at the latest by the second day after the ceasefire and to be completed within 14 days the withdrawal of all heavy weapons by both sides and the creation of security zones of 50km free of artillery; of 70km free of artillery of 100mm calibre or greater; and 140 km free of tactical missile systems, such as Twister, Hurricane, Tornado. For Ukrainian forces the point from which withdrawal is measured is the present line of hostilities; for the DNR and LNR forces it is the line established by the September 2014 Minsk Accords. The security zones will be free of artillery and missile systems but not infantry. This means that the separatist forces will control territory up to the present line of hostilities. And the territories on both sides of the border will remain militarised. The OSCE to monitor and verify the ceasefire and withdrawal of weapons. The OSCE has 350 officers in the region. Together with its support staff the mission totals about 1000 people. The OSCE has acknowledged that it cannot monitor the 500 km border between Russia and Ukraine, that it cannot guarantee its own officers’ safety in many separate parts of the conflict zone and therefore does not even venture into them. Within a day after the ceasefire for a discussion to begin about the modalities for organising under a Law of Ukraine “On the special order of local government in some areas of the Donetsk and Luhansk regions” elections to local government in the affected regions, and for the Verkhovna Rada to confirm in law within 30 days the territories covered by that law within the boundaries established by the September 2014 Minsk Accords. The law in question, intended to decentralise power and authority to the parts of Donestsk and Luhansk at war with Kyiv, was adopted by the Ukrainian parliament (Verkhovna Rada) in October last year in fulfilment of one of the conditions of the September 2014 Minsk Accords. The leaders of the Donetsk and Luhansk People’s Republics then ignored this law and organised their own referenda and elections according to their own rules, which led President Poroshenko to withdraw the law in question. The question arises: will the DNR and LNR leaders ignore this law again, or take it merely as recognition of their right to autonomy under whatever rules they choose? Because this clause of the February 12 Package of Measures applies to territories “within the boundaries established by the September 2014 Minsk Accords”, it does not extend to the new territories captured by the separatists since September 2014. So whose law will govern the establishment of local self government in them? The provision of pardons and amnesties by the prohibition of prosecutions against people who have taken part in the events in the affected areas. This has been a demand of the separatist leaders who foresee themselves exchanging the gun for the briefcase and becoming “normal” politicians and businessmen. They want to feel safe wherever they go. But what about people who have committed war crimes, who have kidnapped, tortured and killed prisoners, both civilian and military? Ukrainian law covering such crimes applies to Ukrainian combatants in the conflict. Why should combatants on the other side be exempted? The release and exchange of all hostages and prisoners of war. How will people find out what’s happened to members of their own family who are missing? Hostages and prisoners are to be exchanged “all-for-all” within five days of the ceasefire. But then there will be people still looking for lost relatives and friends. Will full lists of captives be published by all sides, including those who died in captivity? Will the Russian government provide a list of its prisoners, its own soldiers missing in action, its own dead soldiers and where they are buried? Provide for the access, delivery, storage and distribution of humanitarian aid in the affected region “on the basis of an international mechanism”. The long-standing demand of the Ukrainian side is that all humanitarian aid deliveries be supervised by the International Committee of the Red Cross so that such aid does not serve political or military purposes, but is distributed to those in greatest need regardless of their allegiances or place of residence. The restoration of all socio-economic relations under Ukrainian law, including the payment of pensions and benefits, the timely payment of utility bills and the renewal of taxation. This clause identifies a necessary requirement to rebuild and reintegrate a war torn region into the wider national economy ands social structure. However, the intention of the leaders of the DNR and LNR is not to integrate, but to separate the territory they control from the rest of Ukraine. So this clause means that the Ukrainian state is committed to devoting a portion of the taxes it raises to rebuild the local economy and cover the costs of pensions and benefits the DNR and LNR are incapable of providing and that the Russian state is hard pressed to provide in its current economic difficulties. Restore full control over the state border of Ukraine by the government throughout the conflict zone, which should begin on the first day after the local elections take place and should be completed after a comprehensive political settlement (local elections in the individual regions of Donetsk and Luhansk on the basis of the Law of Ukraine and constitutional reform) by the end of 2015, subject to paragraph 11 of these Measures – in consultation and agreement with the representatives of individual regions of Donetsk and Luhansk in the framework of the Tripartite Liaison Group. According to this clause, the Ukrainian state can gain control of its side of its border with Russia only after it cedes control of territory in a “comprehensive political settlement”, including a constitutional guarantee of these regions’ self rule, and only then no sooner than the end of 2015. By which time the DNR and LNR will have consolidated their control right up to the border they are supposed to cede control of to the Ukrainian state? The withdrawal of all foreign armed forces, military equipment, as well as mercenaries from the territory of Ukraine under the supervision of the OSCE. Disarmament of all illegal groups. On the day these present Package of Measures was agreed Russia moved more heavy armour across the border towards Debaltseve. The OSCE by its own admission is incapable of monitoring and verifying implementation of this clause. The border with Russia will by these Measures stay open and unsupervised by the Ukrainian state until the end of 2015. First, the adoption of a new constitution in a democracy is the prerogative of the people, not of their leaders. A national leader agreeing to a new constitution in the course of negotiations with foreign powers makes a mockery of the principle of popular sovereignty. The Note below discloses the full weight of this constitutional commitment. It shows that Poroshenko has promised to the DNR and LNR (but to no other part of the country) a wide ranging special status within Ukraine that will include their own armed forces, public prosecutor, courts, exemption from Ukrainian national law, active support for the development of close relations with neighbouring Russian provinces (but no reciprocal commitment to the substantial Ukrainian minority living in those Russian provinces) and the active and substantial material support of the central state for their socio-economic and cultural development. All that is missing here is the full right to form their own foreign policy, for some such right is already partially granted with respect to their relations with the Russian Federation. Matters relating to local elections will be discussed and agreed with the individual regions of Donetsk and Luhansk in the framework of the Tripartite Liaison Group. Elections will be held in compliance with the relevant standards of the OSCE, with monitoring by the OSCE Office for Democratic Institutions and Human Rights. This clause recognises an enhanced right of the DNR and LNR to determine how elections to government of their regions will take place, and gives representatives of the Russian Federation and the OSCE in the Tripartite Group a role in the process as well. To intensify the activities of the Tripartite Liaison Group, including through the establishment of working groups to implement the relevant aspects of the Minsk Agreement. These working groups will reflect the composition of the Tripartite Liaison Group. The Russian state, alongside the Ukrainian state, the DNR, LNR and the multilateral OSCE, becomes a permanent party to the ongoing resolution of this conflict. – The powers of local council deputies and officers elected in pre-term elections called by the Verkhovna Rada of Ukraine according to this law cannot be terminated. The Presidents of France, Ukraine, Russia and the German Chancellor also adopted a declaration of support for the implementation of the Package of Measures to Implement the Minsk Accords.